Volunteer Rangeland Fire Protection Associations are often the first responders on rural sagebrush country fires. Photo by Jordan Valley RFPA. The following story is by Julia Babcock, Project Coordinator for the National Policy Consensus Center and staff support for the Oregon Sage-Grouse Conservation Partnership. Humans have been deciphering smoke signals since the beginning of time. But on the morning of August 11, 2018 the smoke was so thick that none of the vigilant landowners involved in the Oregon Rangeland Fire Protection Associations (RFPA) could see much of anything, even a mile out. With a 500-acre head start, a fire was spreading in the Warner Valley but critical visual clues were covered in a thick smog surrounded by peaks over 7,000 feet high. Then came help from above; satellite technology picked up an unusual heat signature north of the Hart Mountain Refuge. The satellite, which captures infrared images and posts them online every six hours, identified a fire’s footprint. 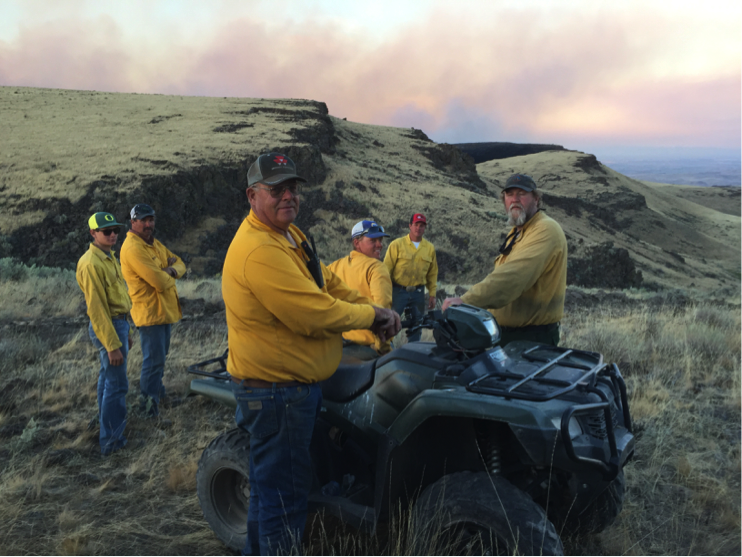 Word began spreading faster than the fire, thanks to the network of community-based partnerships in Oregon between the Bureau of Land Management (BLM) and RFPAs. It was through the radio systems they invested in that allowed them to activate dozens of volunteers quickly. The rugged terrain in the remote area where the fire started lacked sufficient water supply to use in the firefight. In response, the Warner Valley RFPA immediately began mobilizing their retrofitted military vehicles. Within four hours, they had 18,000 gallons of water hauled onto the site and more help on the way. The next line of the collaborative effort came with the Frenchglen RFPA, which deployed six engines to the fire site. Critical fire suppression equipment and capacity also came from Lakeview and Burns BLM crews along with Sheldon-Hart and Malheur Refuge engines from the U.S. Fish and Wildlife Service. Within 24 hours, and despite the 20 mile-per-hour winds, the fire was under control. Volunteer members of the Jordan Valley RFPA know the country well and are an efficient resource to combat rangeland fires. Photo by Jordan Valley RFPA. Historically, fires in sagebrush country occurred only every couple of decades in colder, wetter sagebrush lands at higher elevations and every few hundred years in the hotter, dryer, and lower elevations. Contemporary fire cycles have substantially changed from these historic trends. The hotter-dryer lower elevations are experiencing much more frequent fire intervals that don’t allow the landscape time to recover. This is primarily due to the fire’s interaction with non-native invasive grasses (like cheatgrass) that dry out early in the season, which causes them to burn faster, hotter, more frequent, and larger in size. This has resulted in land managers seeking to manage large-scale wildfire in sagebrush whenever possible. Oregon has developed a robust network of RFPAs which now covers over 16 million acres of critical sage-grouse habitat and livestock forage. Paul Henson, State Supervisor in Oregon for the U.S. Fish and Wildlife Service reflected on the benefits of investing in local capacity to address fire threats in rangeland communities. “Oregon benefitted significantly from the rapid response of RFPAs and BLM boots on the ground in the 2018 fire season,” Henson said. “Their integrated approach to locally managing fires is critical in protecting multiple sagebrush plant and animal species." Marvin Vetter, Oregon’s Rangeland Fire Protection Association Coordinator, shows off radio equipment at the 2018 Sage-Grouse Conservation Partnership Summit. It’s tools like this that bolster communications when time and safety are of the essence. Photo by Julia Babcock, NPCC. The ability to gather data from satellites and use radio equipment across the sagebrush landscape is a new frontier in fire management bolstered by state and federal investments leveraged through BLM’s fire resources, Oregon’s Sage-Grouse Conservation Partnership, and numerous other partners. Collaborative efforts help ensure the valiant efforts of volunteers are well-equipped to manage threats to their livelihoods and the sagebrush landscape.